The Cooperative Village Housing Developments are located in the Lower East Side of Manhattan. East River Housing (in purple) is at FDR Drive and Grand St, right across the park from the East River and just south of the Williamsburg Bridge. East River Housing Corporation includes a (triangular) commercial building on Grand Street. 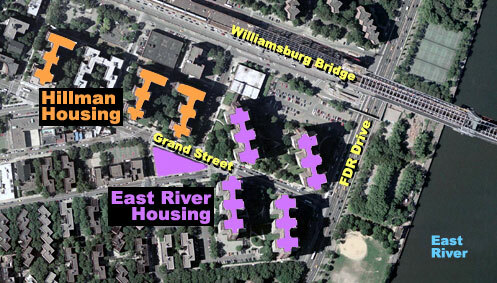 Hillman Housing (in orange) is just west of East River Housing along Grand Street. Click over a colored building on the map to the left for more detailed views.